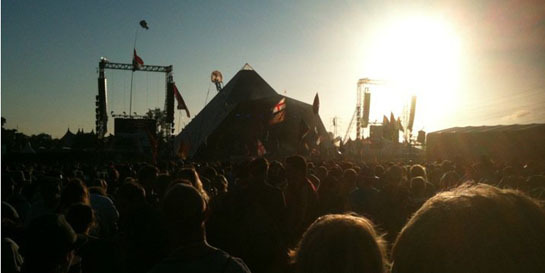 Glastonbury has to be one of the musical highlights every year. Cramming onto a farm with 150,000 people isn’t everyone’s idea of fun but loads of people here at Universal HQ are hooked. The excitement for everyone here at Fiction and Polydor began back in February when we first found out that Elbow had been confirmed to play on the main stage. We’ve had the fortune of working with Guy and the band for over three years. They are a lovely bunch that would be at Glastonbury even if they weren’t on the line up. The weekend was the usual success despite the rain, mud and greasy food from a van. Some of the highlights included Laura Marling, Anna Calvi, Fleet Foxes and Island’s Mumford and Sons, but the defining moment of the weekend had to be the five lads from Manchester. The ‘reverse Mexican wave’ had the whole crowd, row after row, duck down in a rippling human sea to which Guy jokes, "I'm sick with power." The only low point was the failed lantern we tried to lauch mid-way through the set came crashing down, nearly setting alight to the group in front of us. When we left the arena that evening we could only hope that the amazing performance had translated across onto the BBC coverage. Build A Rocket Boys, the bands current album, climbed back up 30 places on the iTunes chart within 24 hours of the televised show; testament to how amazing the band are live and the true importance of Glastonbury to music.